A layered material with a lightweight metal matrix syntactic foam core offers strength, even when bent or compressed. In tests, the material showed promise for use in automobiles, trains, ships, and other applications. 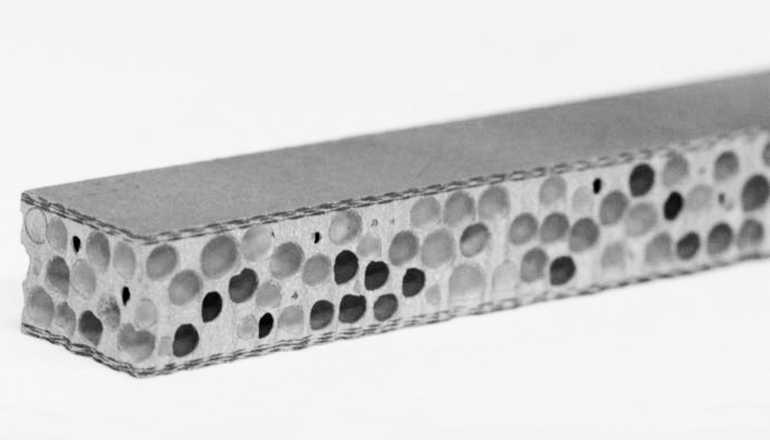 By contrast, metal matrix syntactic foams incorporate porosity in their foam-like structure with hollow particles. In recent years there has been an upsurge in the use of these materials, mainly because of their compressive strength. However, bending strength was a limitation for many potential applications, notably automotive structures. Metallic foams previously have been sandwiched between two stiff sheets, which provide increased flexural strength while the foam core allows the material to withstand large deformation and absorb energy. But Nikhil Gupta, associate professor in the NYU School of Engineering’s department of mechanical and aerospace engineering, and his colleagues are the first to develop a metal matrix syntactic foam core sandwich composite. The study, published in Materials Science and Engineering: A, focuses on an aluminum alloy filled with hollow alumina particles sandwiched with carbon fabric face-sheets. The researchers discovered that the resulting layered material reduces weight but also increases stiffness and offers high energy absorption. These qualities make the metal matrix syntactic foam sandwich attractive for automotive floorboard panels and other applications in which bending properties are important.